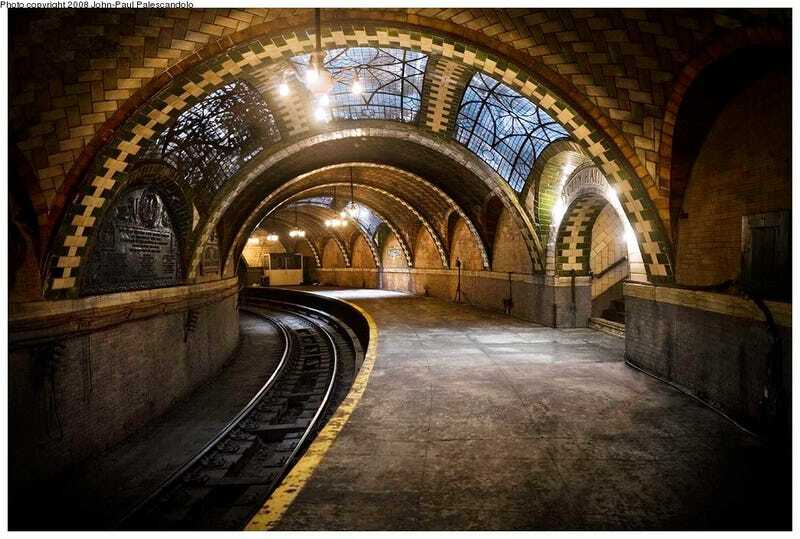 New York's famous City Hall subway station, one of the most gorgeous gems in the world of mass transit, has been closed for decades. Now it can be viewed again by in-the-know riders of the 6 train. Here's how. The City Hall Station was the original southern terminus of the first "Manhattan Main Line" built by the Interborough Rapid Transit (IRT) Company. The line, opened in 1904, was intended to be a showpiece and crown jewel of the new subway system. Unlike the rest of the line, City Hall featured tall tile arches, brass fixtures, and skylights that ran along the entire curve of the station — a sort of miniature Grand Central Station. In fact, befitting the elegance of the station, it was even the chosen place for hanging the commemorative plaques recognizing the achievement of building the underground train system. However, thanks to an immediate need to expand the original IRT line with newer, longer cars, the City Hall Station was closed just a few decades later on December 31, 1945. The gorgeous wrought iron skylights were covered over and the station was boarded up. Although it would spend the next few decades closed to the public, the tracks were still used as the turnaround point for the 6 train after its final Brooklyn Bridge stop. So, while the station was lost to the ages, it was not forgotten. About a decade ago, New York City began the long and arduous process of restoring the City Hall Station as New York's transit museum, but security concerns that started before September 11, 2001 fully killed the idea after the twin towers fell. Still, although it's not open to the general public, there's a way in-the-know New York subway riders can still see this famous and beautiful architectural glimpse at the city's past. The 6 train used to make all passengers leave the train at the Brooklyn Bridge stop, but no longer. If you have a little extra time, you can stay on the train and view the City Hall Station as the train makes its turnaround. We plan on doing just that later this week.